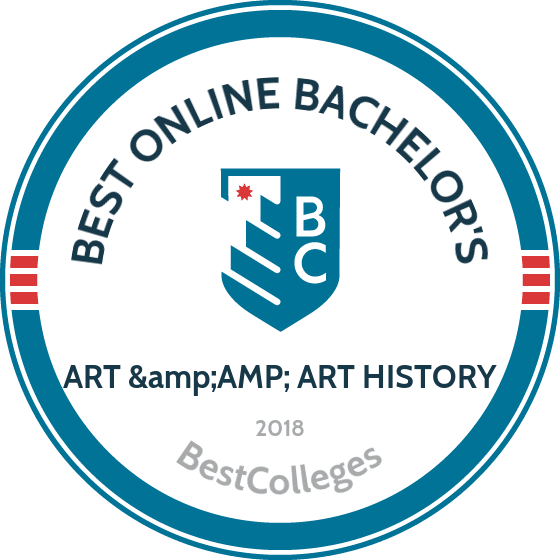 What Are The Best Online Bachelor's in Art & Art History Programs? What Else Can I Expect from an Online Bachelor's in Art & Art History Program? As emerging technologies connect people around the world, artists have the opportunity to share their creativity with a global audience. An online art degree provides the tools and skills needed to create and share art with a wide audience. Graduates of online art history degree programs pursue careers in archival studies and curation. The Bureau of Labor Statistics projects the creation of 4,000 archivist, curator, and museum worker jobs from 2014 to 2024. This page provides information to help you choose the best online art degree to nurture your creativity and begin your career. With campuses located throughout the greater Phoenix area, ASU is known for its innovation and accessibility. The school serves more than 50,000 students each year and offers a variety of distance learning programs, including a BA in art history. This online art history degree prepares students for careers as curators, archivists, and museum technicians. Full-time students can earn their degree in eight terms and enrol in online courses on topics like prehistoric art, art of the Renaissance, and the history of photography. Students also develop research methods that are commonly used by art historians. As students near the end of their degree, they must complete a pro-seminar that includes a group research project that allows advanced students to virtually collaborate and synthesize concepts discussed throughout the program. Applicants must complete an online application and meet ASU's competency requirements. ASU is accredited by the Higher Learning Commission. UMass provides an academic experience that emphasizes practical training for professional growth and is rooted in community outreach and global commitment to positive change. The school boasts one of the most expansive online learning programs in New England, including a bachelor’s degree in liberal arts with an art history concentration. This 120-credit art history degree online includes a multidisciplinary curriculum that teaches students well-rounded perspectives and marketable skills. The art history concentration includes courses on contemporary and historically significant art, creative processes, and cultural implications surrounding works of art. Students must also complete six credits of coursework in art history, on topics such as art appreciation, comparative arts, and studies in world art. They must maintain a minimum GPA of 2.20 throughout the program to graduate. UMass is accredited by the New England Association of Schools and Colleges. Since its founding in 1971. SUNY Empire has offered programs that are ideal for working adults. The school's online art degree offers a variety of concentrations in areas like painting, music, or film. The program features three major areas of study: visual, performing, or media arts. Students pursue their studies through one or a combination of the following approaches: practice, history, or criticism. Students who pursue a creative practice concentration can enroll in courses in New York City under the guidance of a faculty mentor. The curriculum emphasizes creative growth and critical analysis and includes courses on subjects like three-dimensional design, issues in contemporary art, and foundations of drawing. Graduates are prepared for careers as visual or performing artists working in film, teaching, and the management of art organizations. SUNY Empire is accredited by the Middle States Commission on Higher Education. Lindenwood is located in St. Charles, Missouri, and traces its roots back to the Presbyterian Church, offering a wide variety of programs that emphasize Judeo-Christian traditions. The university offers an online art history degree that builds upon this liberal arts foundation. Throughout the program, students explore various components of visual culture, including the social and political contexts in which historical pieces were created. The major curriculum consists of 39 credits of art history courses on topics like ancient art, history of graphic design, and art theory and criticism. Students must also complete a two-dimensional design course in which they examine the elements of design and create works of art. Finally, this art history BA concludes with two capstone courses where students develop a research paper and participate in an internship. The program features a fast-track option that allows students to earn their degree in just three years. Lindenwood is accredited by the Higher Learning Commission. All academic programs at Prescott emphasize personal growth and civic service. The school offers a variety of distance learning programs that allow students to engage with their peers in an inclusive, virtual setting. The bachelor of arts - arts and humanities concentration features an online curriculum with a brief orientation residency on campus. This 120-credit online art degree program includes interdisciplinary coursework in writing, research, and the humanities. Graduates are prepared to pursue careers in teaching, curation, and visual arts. Transfer students can apply credits earned from other regionally accredited schools towards their degree. Those with past U.S. military services training may also earn college credits for this experience. Applicants must submit an online application, official transcripts, and an admissions essay to be considered. Prescott is accredited by the Higher Learning Commission. When choosing an art degree program, students should ensure the program's course offerings align with their personal goals and passions. Below are key areas to consider when pursuing an online art degree. While the following courses are common for art and art history curricula, specific degree requirements vary by program. Online art degree programs typically require the following courses. While curriculum requirements vary by program, art and art history majors often complete a combination of studio and art history courses such as those listed below. Ancient Art: This course explores ancient art forms from the beginning of documented human existence to the Middle Ages. Students examine the creative processes used by early civilizations and the social, political, and religious influences surrounding works of art. Knowledge of ancient art prepares students for careers as teachers, archivists, and curators. Renaissance Art: This course examines works of art created during the Renaissance, a period of cultural enlightenment in Europe from 1300 to 1600. Familiarity with Renaissance art and its cultural context prepares students to pursue careers in history and art museums, libraries, and educational settings. Painting: Most fine arts bachelor's programs offer beginning to advanced painting courses. Beginning painting courses familiarize students with traditional approaches to creating art with oils, acrylics, and watercolors. Advanced painting courses involve a studio project, during which students experiment with techniques to develop a personal painting style. These courses prepare students to become visual artists and teachers. Research Methods: Often required for art history majors, this course includes topics in research design, data analysis, and scholarly writing. Training in academic research equips students to pursue advanced degrees or work as historians or journalists. How Long Does it Take to get an Online Bachelor's in Art & Art History? The average online art degree consists of 120 credits and takes full-time students approximately four years to complete. Earning an accelerated art degree online allows students to graduate more quickly — in approximately three years. Students with transfer credits or equivalent experience may be able to waive course requirements and graduate sooner. Program requirements, such as an internship, also affect the amount of time required to earn an online art history degree. Online art degree programs are either cohort-based or individually paced. Cohort programs typically have two start dates per academic year. Students form a learning community and advance through the program together. Self-paced programs allow students to complete assignments independently and frequently feature rolling admissions with start dates throughout the year. Both program structures offer advantages depending on the student's learning style and need for flexibility. As you explore online art and art history degree options, ensure each program you consider is accredited. Accreditation ensures the program meets national standards of academic quality. The two major types of accreditation in the U.S. are regional and national. Regional accreditation is the most common; nearly 90% of higher education institutions hold regional accreditation. Many graduate programs only recognize degrees earned from regionally accredited schools. Nationally accredited colleges tend to be career-centered and often focus on vocational training. While nationally accredited schools typically cost less to attend, credits earned from regionally accredited institutions transfer more easily. Along with regional or national accreditation, art and art history degrees may hold accreditation from the National Association of Schools of Art and Design, a field-specific accrediting body. Students pursuing an online art degree should also look for accreditation from DEAC, which focuses on distance education programs. The Department of Education (ED) and the Council for Higher Education Accreditation (CHEA) oversee accrediting bodies and ensure they uphold academic standards. Review the ED and CHEA databases for lists of accredited schools and programs. The following table illustrates the increased earning potential of art and art history professionals in various career stages. Graduates with an online art degree can expect a salary growth of up to 50% over a 20-year career. Earning an art or art history degree online provides a culturally enriching education and prepares students to pursue diverse career paths. Successful professionals in the field possess strong communication skills, an eye for detail, and technical expertise. Self-employed artists have a flexible work schedule and usually have personal studios. Art historians are often employed by museums or galleries and work a traditional 40-hour week. The following occupations demonstrate the many paths available to graduates of art and art history programs. An online art history degree prepares graduates for careers working with valuable pieces of history. Archivists authenticate, appraise, and preserve works of art for private clients or public organizations. Curators and museum workers develop exhibit content, conduct research, and work with other museums to loan or exchange art collections. Craft and fine artists use numerous media and styles to create appealing, dynamic, and even controversial works of art. An online art degree helps artists advance their skills and hone their natural creativity. Many artists rely on craft fairs, art festivals, and online marketing to sell artwork. Art directors juggle many organizational tasks required to develop a cohesive project, such as overseeing budgets and managing a team of designers. Most art directors work at least five years in photography, graphic design, or fine art before assuming managerial duties. Graphic designers use creativity and technical skills to develop products that meet the needs of individual clients or corporations. Graphic designers create logos, brochures, and advertisements using digital photo and illustration software. Entry-level graphic design positions typically require a bachelor's degree. Most multimedia artist and animator positions require a bachelor's degree in art or computer graphics. After earning an art degree online, graduates with skills in two- and three-dimensional animation pursue careers developing content for television, video games, and online media. By taking advantage of financial options, students can earn their art or art history degree online without accruing excessive debt. The U.S. federal government provides financial assistance such as work-study programs and low-interest loans with income-based repayment plans. Begin the process of securing federal financial aid by completing the FAFSA. Students may also apply for grants and scholarships, which are often specific to a field of study. Numerous fine art and art history scholarships are available through private donors and university programs.